The 2011 James A. Garfield Presidential Dollar will complete the fifth year of the circulating dollar coin program honoring the former Presidents. On an overall basis, this will represent the twentieth release. When the program was created it was intended that the obverse carry large dramatic artwork. To accommodate, certain inscriptions were moved to the edge of the coin. For the present release “E Pluribus Unum”, the date and mint mark appear as incused edge lettering. In the past, “In God We Trust” had appeared on the side, but it moved to the obverse in 2009 after some public confusion about the placement of the motto. 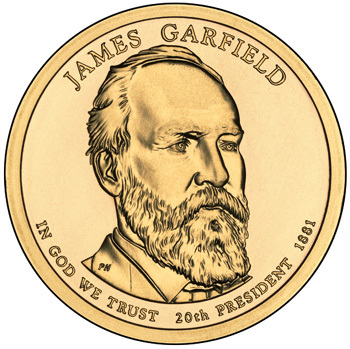 The obverse design carries a three quarters profile portrait of James Garfield, facing right. The required inscriptions including his name, motto, order of Presidency, and years of the term appear surrounding. This was designed and sculpted by Phebe Hemphill. The reverse of the coin carries a rendition of the Statue of Liberty designed and sculpted by Don Everhart. The James Garfield Dollars are expected to be released into circulation on November 17, 2011. On the same date, the US Mint typically also begins selling numismatic rolls of the coins. At prior dates, the coins will be incorporated into several other annual sets and US Mint products.